This recipe is a whisper of springtime green in the middle of a wintry June. We still have herbs a-plenty in the garden at our place, even some basil that is remaining sweet, though it should have gone to seed long ago. The herbs called to me to make something bright and fresh and satisfying. Salsa verde, the result, is full of basil, mint and parsley, and spiked with capers, pickled baby cucumbers, lemon and olive oil. 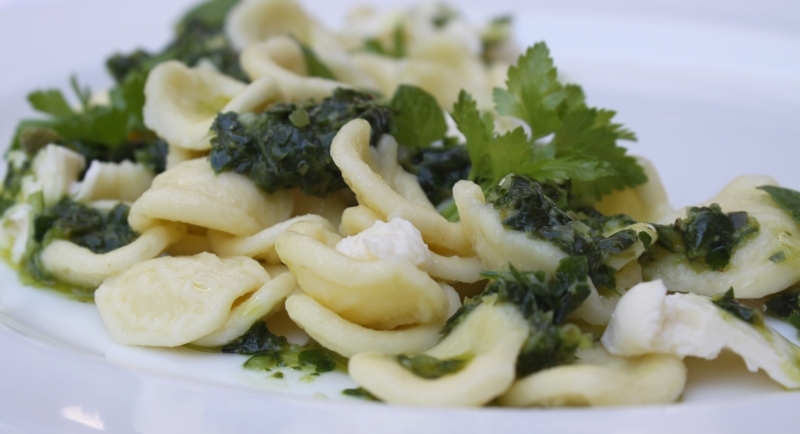 It is marvelous when served with orecchiette, the perfect pasta for it. 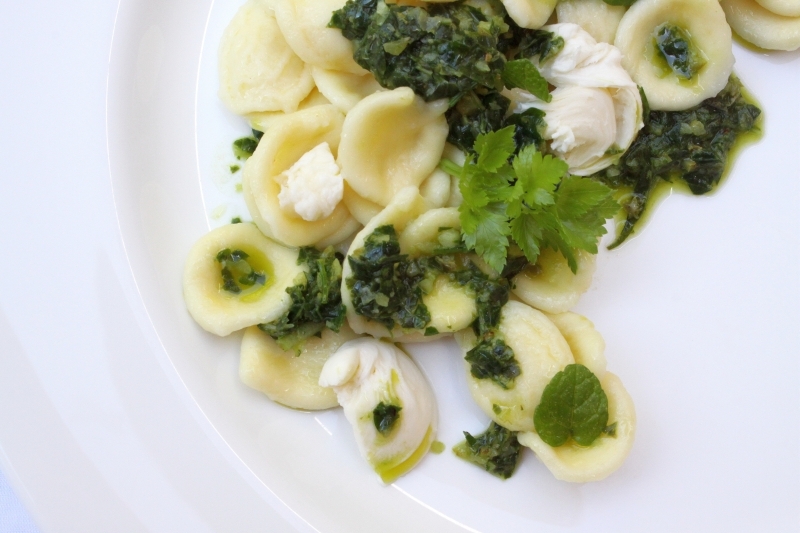 The little indentations in the pasta catch the salsa verde and provide bursts of deliciousness with every mouthful. With a few pieces of creamy soft bocconcini and some fresh baby herbs on top, you will be transported to early September and the beginning of spring. 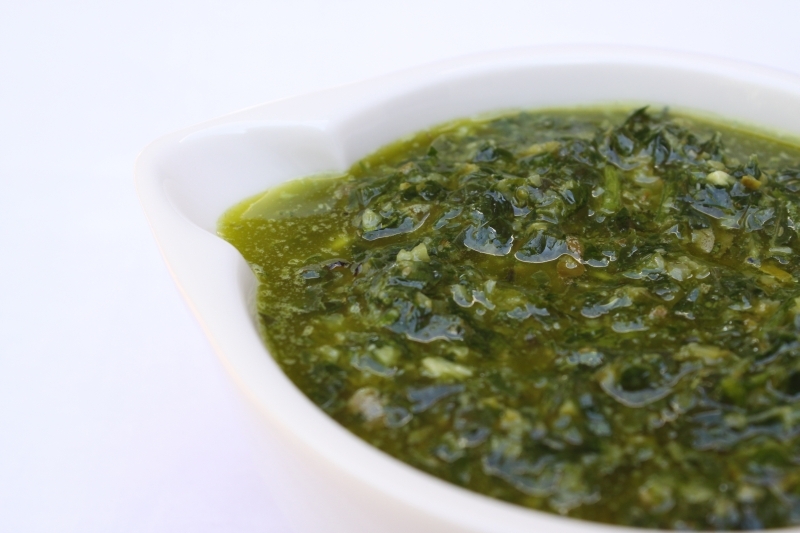 In a food processor combine the parsley, mint, garlic, capers, cornichons, lemon zest and juice, and the olive oil and process until well combined, but still a bit chunky, rather than very smooth. Season to taste with the salt and pepper and set to one side. Bring a large saucepan of lightly salted water to the boil and then add the orecchiette and cook for 8 – 10 minutes, or until al dente. Drain the pasta well and then tumble onto 4 serving plates, or shallow pasta bowls. Drizzle over the salsa verde and top with the bocconcini and fresh herbs. Serve immediately with your favourite white wine. This looks delicious! I love that you use the food processor as well. Jamie Oliver has converted me to using one!! Agreed! I just downloaded the printable version of the recipe – thanks! This really is wonderful! I am constantly making “pulses” and I’ve never thought to add capers or gherkins into the mix. I’m saving your recipe to try this week. I happen to have everything on hand, thanks to the herbs out back… Your blog is so lovely! Thanks so much! I would love it if you tried it and let me know how it went…I’m never sure if my instructions are clear enough. When you have make something a few times, it’s easy to make assumptions and miss out important information. Hope you are having a wonderful summer in your part of the world.